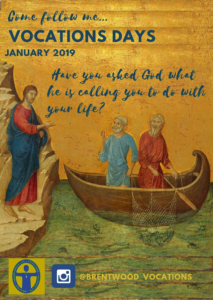 News What is God calling you to do? Vocations Days are due to take place in some secondary schools in the diocese this week. Fr Mark Swires, who is the vocations promoter for the diocese, says: “We’d like to present our life as a call to holiness in whatever state of life God may be calling us to. In this call to holiness we can find happiness in serving God and one another. “Hopefully, the days will encourage the young people to recognise how much God loves us and to them to ask God what he is calling them to do with their life. From this point of view we would encourage them to think about all vocations – marriage, single life, priesthood and religious life. The schools that have agreed to be part of the initiative this week are: Palmer Catholic Academy; Sacred Heart, Upminster; Grays Convent School and Brentwood Ursuline Convent School. Others will be involved in the summer. Fr Mark said that the programme varies from school to school but usually includes an assembly, Mass, time of Eucharistic Adoration and visits to the young people’s lessons by the seminarians, priests and sisters who are involved.